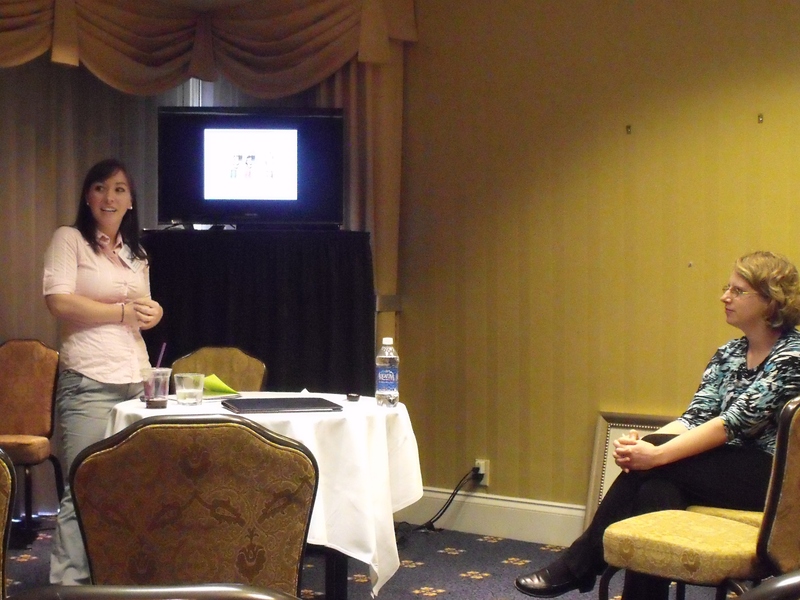 I recently ventured to New Orleans to present at the Popular and American Culture Associations in the South annual conference. Rebecca, another PhD Student at MTSU, and Dr. McCormack, one of my professors who has been super influential in my studies and ideas, joined me on the panel, “Public History and Popular Culture: Use and Abuse.” Needless to say, we had a fabulous time enjoying the sites (and food!) 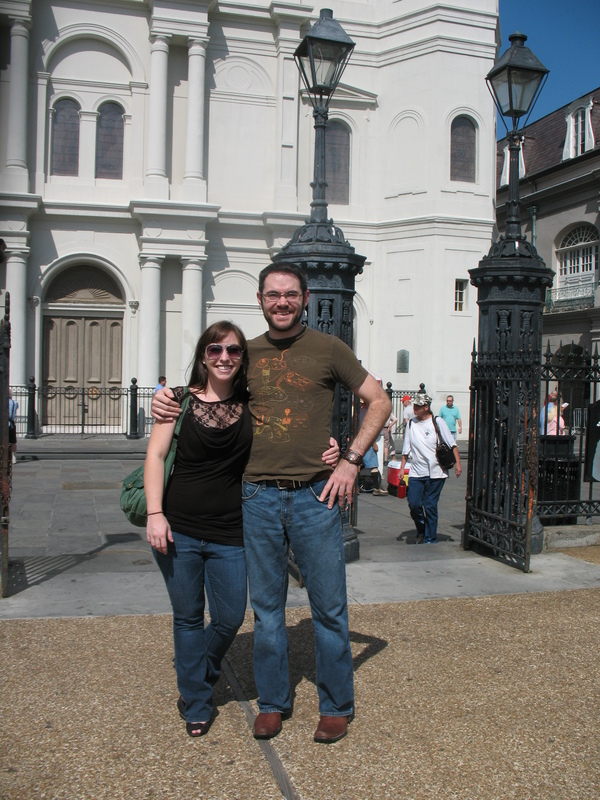 of NOLA, and I felt pretty good about our panel and presentations. However, our panel, being on Saturday morning in New Orleans, was not as well-attended as I would have liked. Therefore, I have decided to present my information to you, my online viewers. We’ve seen social media impacting movements throughout the world and it has even helped to organize the overthrow of politically figures throughout the world. Social media is a part of pop culture through its power to unite people and share information across the world as well as with friends. But can these devices and the internet also teach us anything? And how can these be adapted to use in classrooms? 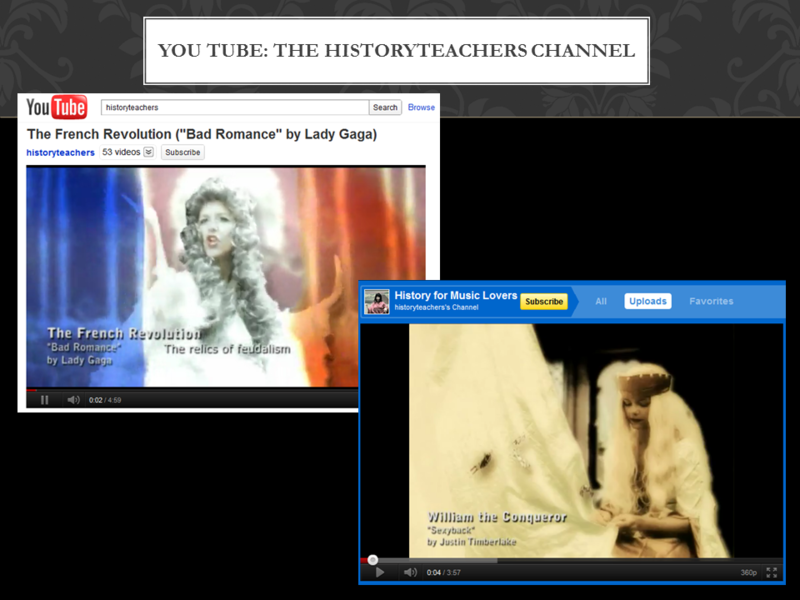 My first example is from YouTube – The Historyteachers channel – Amy Burvall is a high school history teacher in Hawaii who believes very much in engaging her students in nontraditional ways. She uses her own free time to take popular songs, such as Lady Gaga’s Bad Romance and Justin Timberlake’s SexyBack, and write new lyrics pertaining to subjects she is teaching in her classroom. She then dresses in costumes and sings the song for a camera and edits the videos using graphics and effects to make them visually appealing. If you watch the Norman Invasion video, you will never again forget the date of the Norman Invasion. She uses these videos not as the only teaching tool in her classroom, but instead as a jumping off point for her discussions. Students and teachers alike comment on these videos, and almost everyone seems to enjoy them. She has 53 uploads to her YouTube channel with everything from the Beatles, to Lilly Allen, to Nancy Sinatra and Blondie. 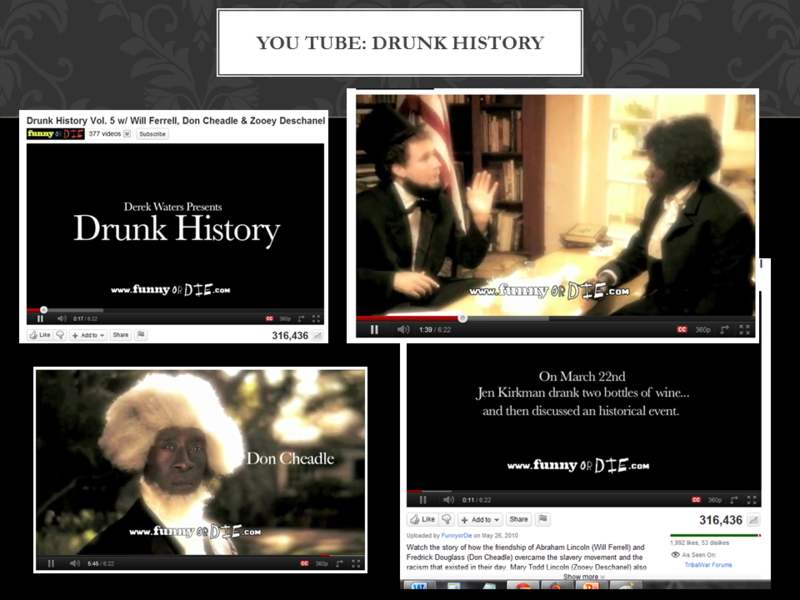 Drunk History – is an interesting experiment in getting historians drunk and then filming them as they explain an historical event or talk about a historic person. Whether or not these are completely staged or not is debatable, but their affect remains the same. The original videos, produced by Derek Waters, have appeared on the Funny or Die website and they permeate Youtube and are shared fiercely on facebook and other social media sites. The drunk historians narrates an historical event, in this case, the relationship between Frederick Douglas and Abraham Lincoln and its impact on the country and race relations. Famous actors, in this episode Don Cheadle and Will Ferrell, with a cameo by Zooey Deschanel as Mary Todd Lincoln act out the narrator’s words and mime the words as if they are their own. The effect these historical figures played by celebrities using popular vernacular of our time is amusing, but at the same time, the stories are generally accepted as true tellings of historical events. Someone may actually learn something about race relations or the roles that these two historical figures played in the beginnings of civil rights and the abolishment of slavery in the United States. Other examples include Jack Black as Benjamin Franklin, John C. Reilly as Nicola Tesla (my favorite!!! ), and Michael Cera as Alexander Hamilton. 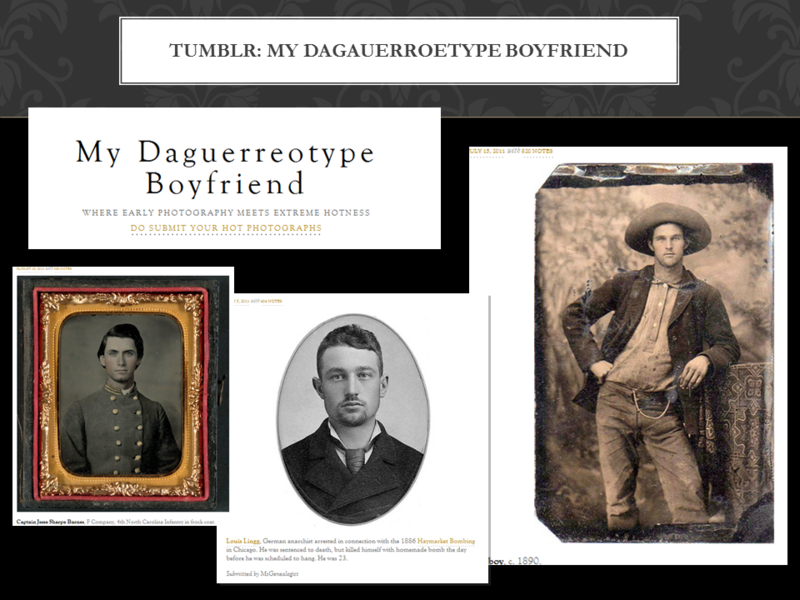 Tumblr- My Daguerreotype boyfriend – this is something I came across in my time as an educational coordinator at a Civil War historic site. The pictures are of actual people from history, who some people think are attractive. This site not only shows the pictures but tells the medium with which the photograph was taken, the year, and sometimes a story about that person. This may teach people something about these people, such as what people wore in that time period, the history of photography, and a plethora of other things. 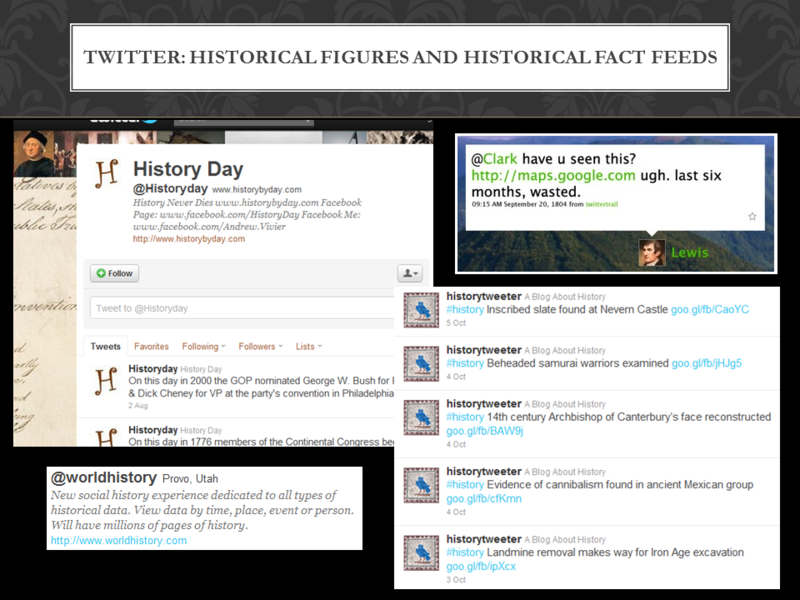 However, I believe one of the most important things that this website does is personalize history. Many people see history as a cold and or dead thing in the past with no bearing on the world today. Looking at these photographs and pictures can help people to realize that these were people with lives and stories of their own. And let’s face it… those are some hotties of history. 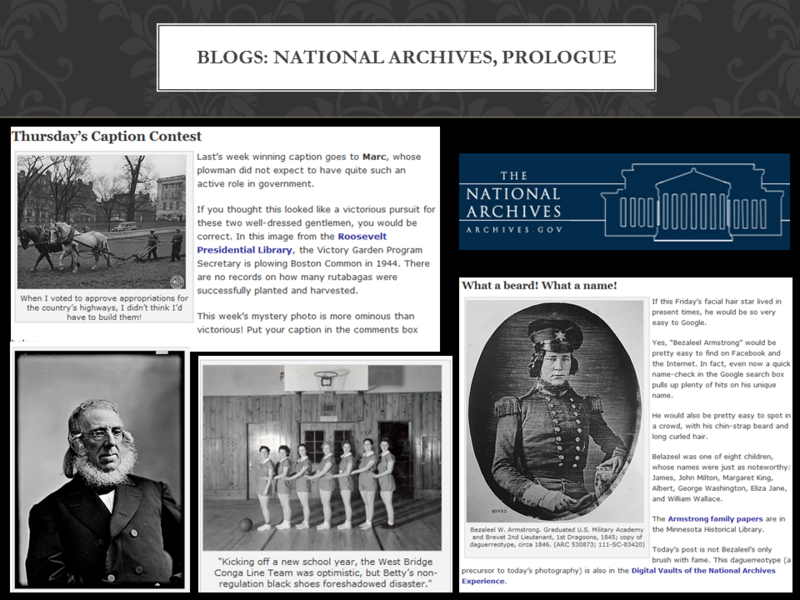 Blogs – The National Archives have several blogs that they maintain, but one of the most interesting to me is Prologue. This site really engages the public instead of just telling stories or listing off historical facts. Not only do we learn about the beard and the person behind it, but we also learn a few interesting historic facts as well. 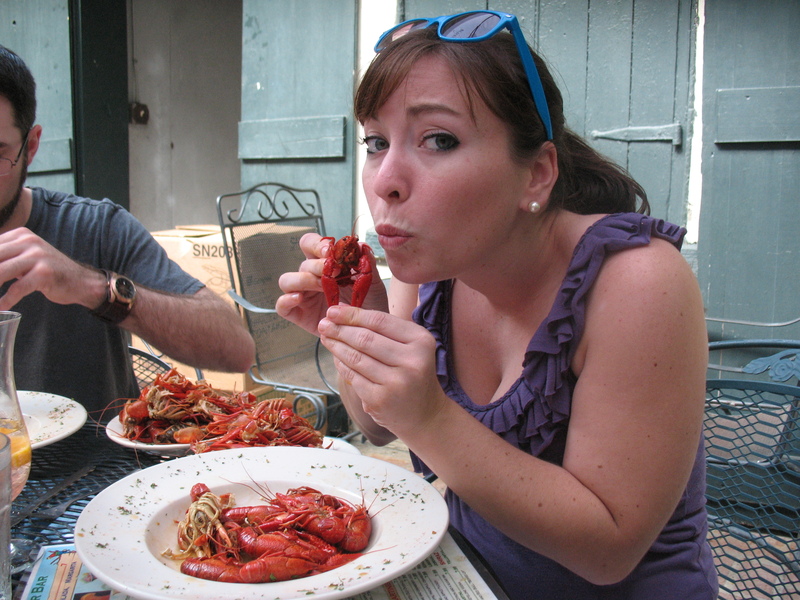 On Thursdays the blog hosts a “Put a caption with this photo” contest. They post a photo from their collection that is funny or interesting and then ask readers to come up with a clever or amusing caption. The winner gets something from their online giftshop, and the following week the pictures’ true story is revealed. Again this engages people, teaches them something, and they get a prize while the national archives boosts sale in their giftshop. 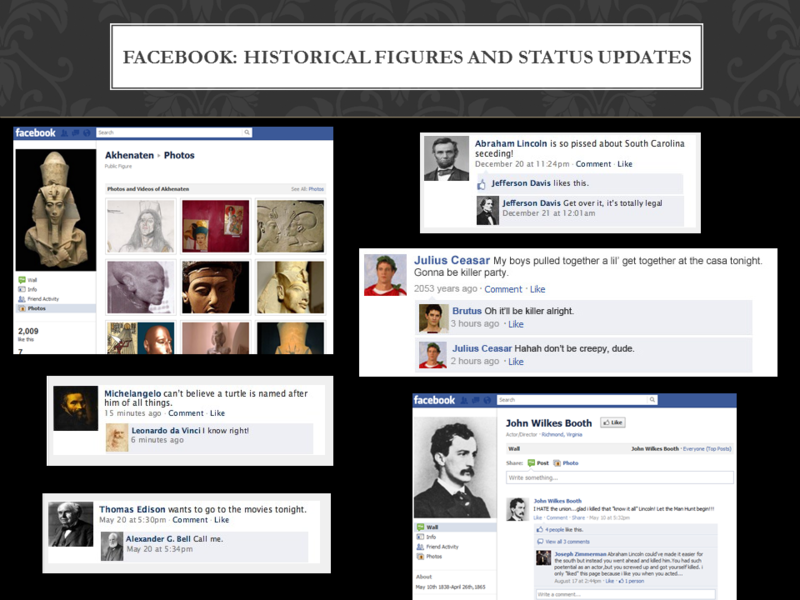 These two slides are pretty self-explanatory – several historical figures are popping up on facebook and on twitter. While these are often times amusing or clever, they also do provide snipets of history and biographical information. As discussed below, I hope to experiment with this more in my class through an extra credit opportunity. With historians these things are generally immensely popular, especially among graduate students. Youtube videos related to historical events make the rounds among my teacher and student friends on facebook and twitter to enormous response and critique. 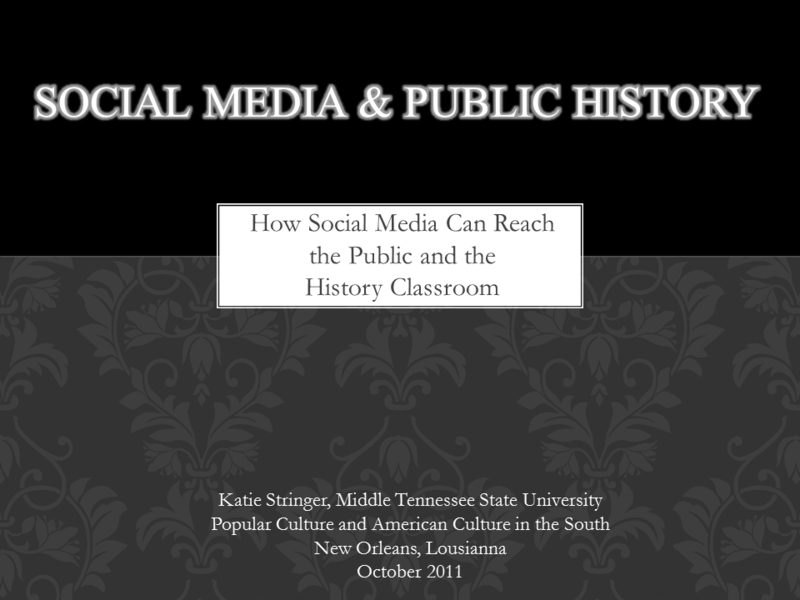 Historical facebook twitters and facebooks are generally maintained by those people who study the figures. However, should I post something on my own facebook or twittwe, historical or related to popculture and history, friends who are not historians or particularly interested also often comment. Their comments are not as varied or voluminous, but they do exist on some level. An interesting study of the effect on the general populous would be valuable to see how these things affect people who are not in the history or education fields. Many comments on youtube videos and articles about twitter and facebook are by people who are interested in the subject matter, are teachers, or are students doing research for a class. However, many times the students comment on how much they enjoyed learning something new in a way that is not usually used in the general classroom. I currently teach a section of World Civilizations to 1500 at Middle TN State University where I have a variety of students and only 3 history majors. While I want my students to learn to appreciate history and what it can teach us, I’m not huge into learning facts and dates, but I believe there are some that are very important. 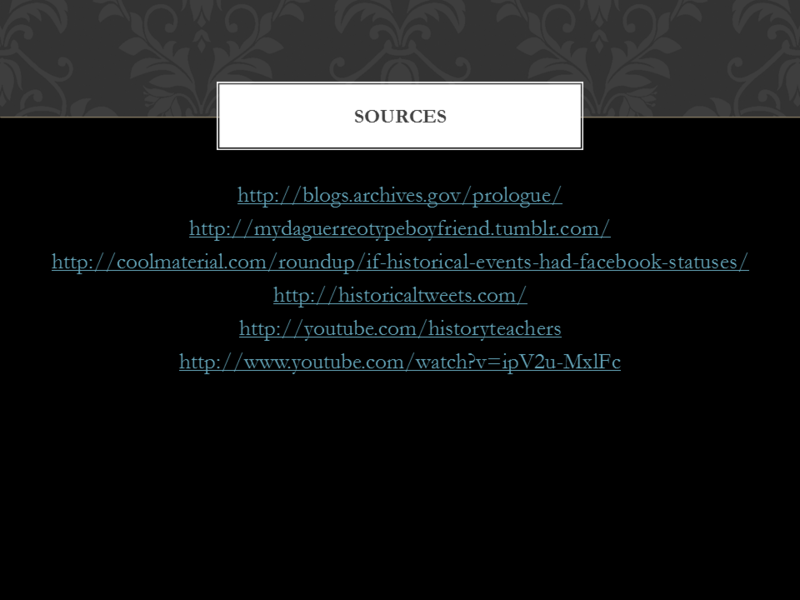 I hope instead that my students can learn critical thinking and the questioning of sources and ideas. When my class studied pre-Hellenistic Greek cultures I opened the class asking them if they remembered from their readings on which island the Minoans lived. No one could answer me until they looked it back up in the book. I then delivered a short presentation on the Minoans, the geography of Crete, the culture and stories of these people, their art, and the archaeological excavations the site has undergone. Once I delivered the information I asked how many of them knew the band Radiohead and enjoyed their music. A large majority of the class was familiar. I then explained we would watch a youtube video, which received exclamations and praise. 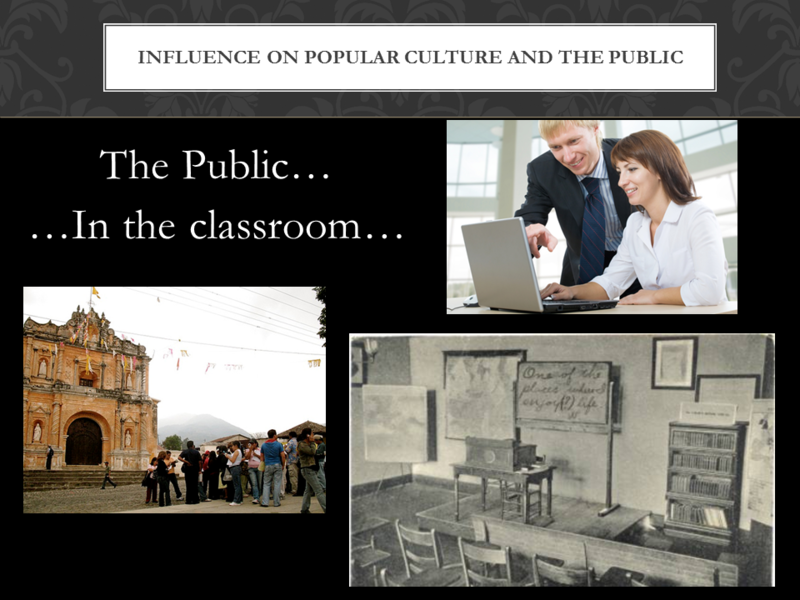 I showed my class “I’m from Crete” by Amy Burvall on the historyteachers channel. The song is a play on Creep by Radiohead, and the chorus repeatedly sings to the viewer, “I’m from Crete… I’m Minoan…” Interspersed throughout the song are other facts about the culture such as their discovery by Sir Arthur Evans, bull-leaping games, and dolphin fresco art. At the end of the video I engaged my students in a discussion about this video. The first reaction from one student was that he thought it was terrible and he couldn’t learn anything from it. I was not going to let him get away with that explanation so I pushed him to tell me why he thought it was awful; perhaps the singing isn’t the best in the world and the graphics are done by a high school history teacher, not Michael Bay. I then asked him, well, where are the Minoans from, and he said from Crete. He then went on to list at least 5 or 6 other small facts about the culture that he had remembered from the video and reneged on his original statement that the video was terrible and worthless. On my students first test I included the fill-in-the-blank question, “I’m from _____________, I’m Minoan.” Every student who was in that class remembered Crete and got it correct. While these facts may not be the most important thing they will learn in my class, I’m still proud that I have been able to use popular culture in the classroom successfully. We also covered questions such as, what does this teach you? Can you learn better from something like this? What do you like and dislike about it? These questions get the students thinking historically and questioning, but still they have fun and enjoy the learning environment more than they would reading a textbook or listening to a lecture. So that was my presentation in a nutshell – unfortunately for you, the internet viewer, you were unable to catch my witty remarks and anecdotes, but I hope this was somewhat beneficial or representative of the content. In other news, I’m about to assign an extra credit project to my class in which they research information needed to create a facebook profile page for a historic figure we have studied. Hopefully soon I will have information to report on that! Nice presentation! Of course, I knew a lot of this from our previous discussions, but I love the way you integrate all of it together. Jordan is taking a class on Using New Technologies (mostly social media) in Education right now, and this blog post was more enlightening than his whole class, from what I can tell! Great job! Fascinating topic. “Tricking students into research” as you say is a brilliant technique. I use it to encourage creative writing within art and design courses. In a Three-Dimensional Design course, my students design natural/man-made hybrid characters. In addition to using traditional means of process development such as gathering photographic resources and using drawings as a means of planning form, the students were also required to create twitter account to develop their character’s personality. All characters followed my alter ego “angryprofessor” and an unexpected result emerged. They began to follow each other and interact with the other characters, despite not knowing the designer behind them. This level of commitment to a creative writing assignment was unprecedented and incredibly rewarding. I love this idea! I also really like the interdisciplinary aspects of social media like facebook or twitter. The interactions among students and also with “agryprofessor” are facinating as well – I wonder how things will go with my students and their facebook assignments? Hopefully I will find out soon – their optional homework is due Friday and I’m already outlining a blog entry about that… I’ll also include the rubric and instruction incase you are at all interested in adapting it to use in art classes! I’ll have to figure out some way to get them interacting together with this assignment, like yours did, in the future… thanks for the comments! !